The San Francisco Ballet, founded in 1933 as the first ballet company in America, opened its 86th repertory season with the annual gala concert featuring a champagne promenade in the lobby and a bill featuring two world premieres and several "house" ballets by resident choreographer/director Helgi Tomasson. Prior to curtain, Chairman of the Board of Trustees Carl Pasquerelli presented Dede Wilsey with the Lew Christensen award for her work as a trustee. Ms. Wilsey declared the company one of the best in the world, which many would agree is an apt characterisation for this West coast troupe. In addition to streamlined physiques, acute sensitivity to musical tempi, and the ability to express emotion, classical ballet requires precise technique, without which the dance becomes messy gymnastics. This is why ballet students seeking training compete for the best teachers in the best schools, not just in the U.S. but across the world. Training can make or break a career, and literally ensure or prevent a long-term profession. Training, along with the right body type, ensure one's spot in an international company -- or ensure that someone else will dance there instead. Few companies can pull off purely classical works without bumbles. The level of technique must be consistently high in order to do so, and not just from the ballerinas and premiere danseurs, but among the corps de ballet in ensemble scenes as well. While Ms. Wilsey's comment was taken to heart by many, for all intents and purposes, San Francisco Ballet is in fact a neoclassical company -- give them Balanchine, or some of the director's own choreographic works, and the dancers excel, unbound by the restrictions of pure classicism. A quick jaunt to Europe, or ideally, to Russia, to visit classical ballet's birthplace makes this clear instantly to even the most amateur viewer. So while an unpolished rendition of Études opened the gala, lacking the nuances of pure classicism, the company has other qualities that can make it great. For one, SFB enjoys stronger financial standing than any other U.S. house due to the strong philanthropic and donor circle cultivated by Mr. Tomasson and his board of directors over the past 20 years or so. As such, they attract world-class dancers and routinely rotate Russians, Asians, Europeans, and Cubans (sadly, Taras Domitro is no longer with the company) through the company's staff. Indeed, by far the highlight of the evening came from two imports: Angelo Greco who hails from Italy and is one of the latest social media and real-life dancing sensations, and his partner imported for the night from Boston Ballet, Misa Kuranaga. That both dancers were the strongest of the evening technically speaking, and neither trained in the United States attests the lower levels in the US ballet training system. Companies such as SFB are forced to dip into external sources in order to raise their technical levels. The good news is that they have the reach and notoriety (who doesn't want to live in San Francisco?) to do so. Shown above: Greco with Kuranaga. Photo courtesy of Eric Tomasson, San Francisco Ballet. Greco danced the duet in Helgi Tomasson's Soirées Musicales to music by Benjamin Britten alongside Kuranaga to thunderous applause. His highly energetic delivery infused zesty pirouettes (he is a left-hand turner) and overhead lifts with electricity. Impeccable lines in his jeté manège with slipper-soft landings proved a salve for both eyes and ears. Kuranaga is an expert at sustained balances, which allows her to punctuate the petit allegro tempi with playful musicality: a series of brisk pirouettes --all of her turns are fearless and perfectly centered-- meld into a long arabesque, teasing the conductor to go on until she catches up -- and she always does. The other true ballerina of the evening was local sensation Yuan Yuan Tan (pictured above), who has become a staple favorite of San Francisco audiences. Tan hails from China, and sports the most ideal physique of anyone at SFB. Her exquisite limbs carved beautiful lines in Yuri Possokhov's Diving into the Lilacs, a lovely chamber piece for two against the backdrop of six corps members dressed in lilac who metaphorically float effortlessly to the music of Boris Tchaikovsky. Carlo Di Lanno, the male soloist, partnered Tan with utmost attention, then jeté-ed into the group of six girls as if diving into a bed of lilacs. There are lyrical moments in this short piece, and Yuan is the answer to Greco's male virtuosity. Her legs skim the floors in Lanno's arms, then she poses like a tall white swan at the ballet's close, and you know you've witnessed something magical. Two ballets offered the requisite nod to George Balanchine: one excerpt from Agon and one from Rubies. Every American company now includes works from this Georgian-Russian choreographer in their repertoire. Although his home was New York City Ballet, Balanchine's ballets are now danced by ABT, Miami City Ballet, Pacific Northwest Ballet, and SFB (Tomasson was a former member of NYCB, cultivated on a diet of Balanchine works). Agon appears tighter when danced by the Mariinsky Theatre and Rubies more electric when Russian soubrettes fulfill the role. Yet for first-time viewers, these excerpts at least offered a taste of Balanchine dishes. When done well, they can be electrifying. The world premiere of Danielle Rowe's Unsaid featured Sofiane Sylve's statuesque frame alongside Aaron Robison (shown at left) in an abstract piece to music by Ezio Bosso. The low hum of piano chords accented by bass tones created a melancholy, dramatic atmosphere, yet the pair directed all emotion to the movements rather than to each other. The work won a standing ovation but left questions about its message. The bill for the gala ended with an excerpt from Justin Peck's Hurry Up, We're Dreaming. Dressed in 1980s plastic pants and midriffs with "big hair" and jazz shoes, company members rocked out to a recorded soundtrack (recalling Flashdance) that proved anti-climactic in its non-balletic presentation. While pointe shoes and tutus aren't always required in order to impress the audience, large sections of choreography underused musical highlights, and the dancers appeared lost in a discipline that, with few exceptions, is not their own. SFB has much to be proud of, and serious talent in its ranks. Giving that talent the appropriate outlets in which to shine is key to their ongoing success. It will be interesting to see what this season brings. 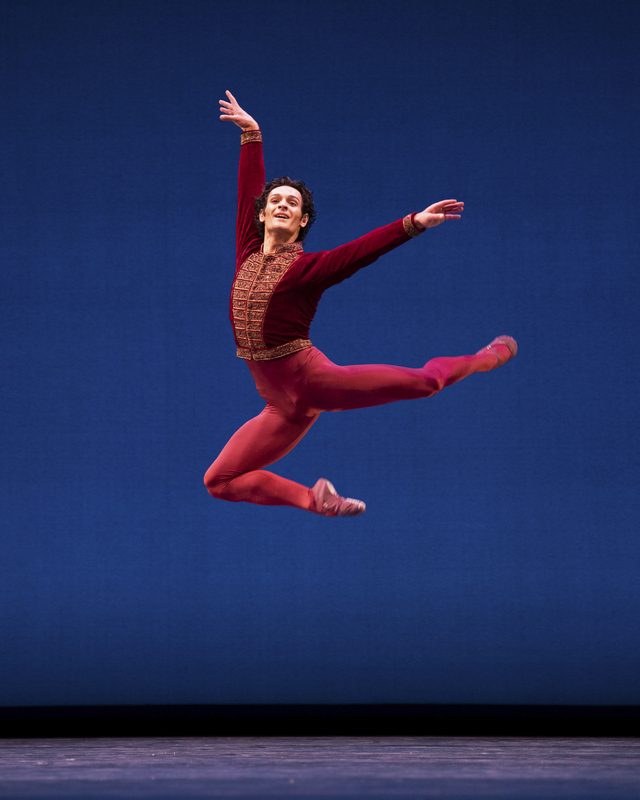 All photos by Eric Tomasson, courtesy of San Francisco Ballet.